HandPunch - Baztech Incorporated (Pvt) Ltd. 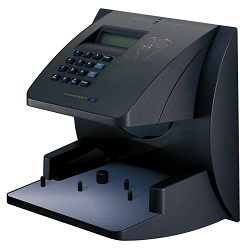 The HandPunch is such a versatile biometric timeclock that it can fulfill even the most demanding business requirements.Having multiple communication options, such as RS-232, RS-485, TCP/IP, and modem, gives you the flexibility of installing it pretty much anywhere you want. You can even daisy-chain multiple units together using one main cable (useful for companies wanting two or more clocks side by side to facilitate speed of punch entry). Also, the clock has two extra buttons, which are programmable through our software, that enable your employees to enter other data at the unit besides the normal clock in/clock out functions. For example, if you pay your employees a different wage based upon the department they happen to be working in on that day, then they can enter their department code at the clock. This will make life much easier for the payroll administrator, because it cuts down on the amount of human intervention that was previously involved in accomplishing a task like this. Weighing approximately 6 pounds, the HandPunch 3000 is extremely durable as its outer shell is a hard plastic that is resistant to impact. With 512 users as the standard capacity, it is also upgradeable to a maximum of 32,512 users; more than enough to accommodate even the largest enterprise.